AMENDS’ mission is to create a platform for promising youth leaders whose work impacts the Middle East, North Africa, and the United States to share and grow their initiatives. During the conference, we provide delegates opportunities to develop key skills, network and collaborate with established leaders, experts, and fellow changemakers, and share the story of their initiatives with a wider audience after receiving coaching and editing support. 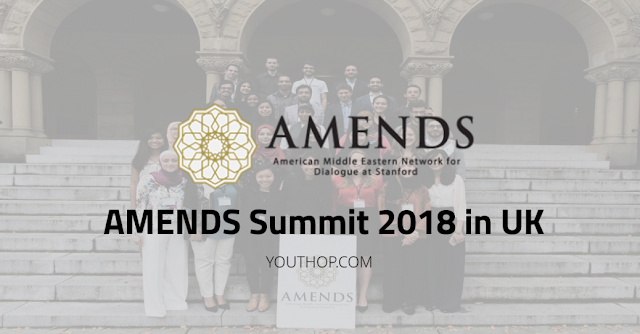 AMENDS is a student initiative at Stanford University that brings together the most promising youth change agents from across the Middle East, North Africa, and the United States to learn from each other, connect with global leaders and resources, and share, through TED-style talks, their ideas and experiences with the world. AMENDS has three main components: networking, summit, and the AMENDS Talks. During the summit, delegates will share their ideas, collaborate on their initiatives, and interact with world leaders in workshops, panel discussions, and formal networking events. The conference will culminate in the AMENDS Talks, presentations from all of the delegates on their initiatives, ideas, and experiences. These presentations will be shared online for the world to see. Present a 10-12 minute video talk about their initiative at AMENDS conference. Hosted on a channel, these talks have over 70,000 people. Attend workshops and talks at the conference. In the past, this has included a talk by Prince Moulay Hicham, a workshop on presenting by the Stanford Graduate School of Business, and a workshop on design thinking by the Stanford d.school. Receive financial and logistical assistance with flights and visas to and from the 2018 AMENDS conference. Accommodations and food will be provided. Join and take leadership in the AMEND Fellows Network, a self-sustaining network of 120 former delegates. For the past 3 years, a separate conference has been held annually for fellows at Koç University in Istanbul, Turkey. Have innovative ideas and well thought-out initiatives that could effect positive change in the world. Have initiatives addressing political, social, or economic issues affecting the Middle East.